We would like to put forth our view in response to "Posterior mediastinal mass : d0 o we need to worry much?" by Lalwani et al. The article presents interesting facts. It introduces to the reader by stating that posterior mediastinal mass carries less anesthetic implications. The authors mention that these masses, with progression, can compress the vital structures including the trachea and the bronchus. The index patient has initially presented with pain, weakness and grade 1 dyspnea with hoarseness of voice. With the mention of the absence of orthopnea, non-productive cough, stridor etc. the authors, it seems, presumed that there is no airway compression. However, the given axial computed tomography image [Figure 1] shows evidence of airway compression. The scan clearly shows that the mass has started from the paravertebral region and extended anteriorly to push the esophagus and the trachea anteriorly. On comparison with a normal cross section image of the chest at this level, the displacement and loss of contour of the airway secondary to the compression by the mass is evident [Figure 2]. Even though, in the patient, there is lack of clinical evidence of the airway compression, the objective imaging evidence of airway compression should have warned the attending surgeons and the anesthesiologists of the issues related to the airway. In a similar scenario (airway compression by a cyst), Tempe et al. recommended to relieve the compression of the airway before definitive surgery. The clinical and imaging information indicate a single stage debulking of the tumor like that for cervical/thoracic dumbbell tumors with airway compromise. The anesthesia approach would have been on the lines of managing a patient with difficult airway including short acting anesthetic agents, avoidance of muscle relaxants and maintenance of spontaneous respiration. In the present patient, while the patient underwent spinal decompression in prone position, the authors chose to manage anesthesia in a routine manner like any other case and at the end of surgery, turned the patient supine, reversed the neuromuscular block and after ensuring return of adequate spontaneous breathing and upper airway reflexes extubated the trachea. The upper airway is known to become edematous after a prone position surgery. It should also be appreciated that following a long duration propofol infusion delayed recovery of the patient due to delayed elimination of the drug from the third space is expected, the recovery can be further delayed if the patient is obese and large. It is now difficult to assess the cause of post-operative airway crisis with no mention of patient weight, duration of surgery and the responses to train of four that would have shed some light on the cause of immediate respiratory distress. Erdös et al. have assigned "severity grade" for difficult airway using a three-grade clinical classification scale: "safe," "uncertain," and "unsafe", whereby each stage triggers appropriate action in terms of staffing and apparatus, such as the provision of alternatives for airway management, cardiopulmonary bypass and additional specialists. In the case of patients classified as "safe" or "uncertain," a pre-operative consensus with the surgeons should be reached as to the anesthetic approach and the management of possible complications. In this patient, the presence of adequate luminogram on radiograph and contrast-enhanced computed tomography might have led to misinterpretation of the underlying airway pathology. However, from the radiology point of view airway displacement and loss of contour and compression was evident. The plan of surgery and anesthesia should have taken these findings in consideration and modified the management suitable for that of an airway compression. 1. Lalwani P, Chawla R, Kumar M, Tomar AS, Raman P. Posterior mediastinal mass: Do we need to worry much? Ann Card Anaesth 2013;16:289-92. 2. Tempe DK, Datt V, Virmani S, Tomar AS, Banarjee A, Goel S, et al. 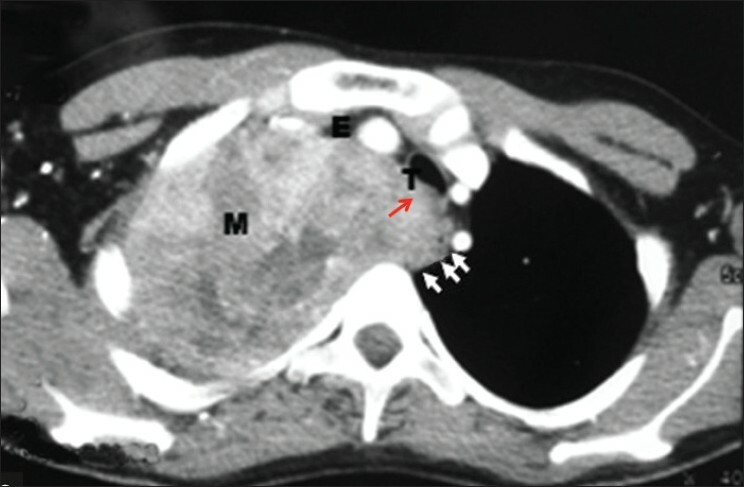 Aspiration of a cystic mediastinal mass as a method of relieving airway compression before definitive surgery. J Cardiothorac Vasc Anesth 2005;19:781-3. 3. Ando K, Imagama S, Wakao N, Hirano K, Tauchi R, Muramoto A, et al. Single-stage removal of thoracic dumbbell tumors from a posterior approach only with costotransversectomy. Yonsei Med J 2012;53:611-7. 4. 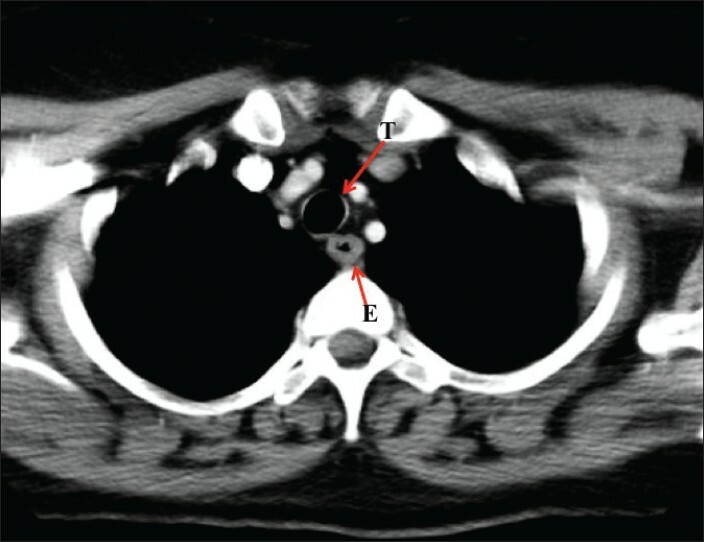 Erdös G, Tzanova I. Perioperative anaesthetic management of mediastinal mass in adults. Eur J Anaesthesiol 2009;26:627-32. Authors of Document Lalwani, P., Chawla, R., Kumar, M., Tomar, A., Raman, P.